Families for Orphans: Jumping from LIFE to DEATH: Where is the HOPSCOTCH of life taking you? Jumping from LIFE to DEATH: Where is the HOPSCOTCH of life taking you? In HOPSCOTCH, Myra tells her friend Michael, in a simple, child-like manner, how anyone on planet earth can get to heaven. If you are a Christian, you know how God has made his plan of salvation so simple that even little children can understand it. In a world that is so full of information, it has always amazed me that most people who are not in God's family have no idea how they can "get in" to heaven. If you have a friend or loved one who has not accepted God's plan for salvation, consider giving him or her a copy of this book. Myra lays out the good news of the gospel as a very logical and easy-to-understand hopscotch game. Although this book is available on Kindle for only 99 cents, it is probably more effective as an evangelism tool if you buy a copy of the paperback to give to your loved one or friend. You can find more information about buying the book on Amazon here: Hopscotch on Amazon . Hopscotch is a little book about LIFE, about life after DEATH, and about BELIEFS. 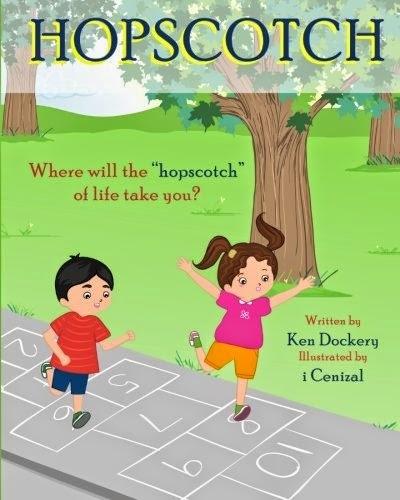 Although Hopscotch takes on the appearance of a children’s book, it is very much a book for every citizen of planet earth. Where is the hopscotch of life taking you? One thing is for certain: all of us will someday be jumping from the LIFE box of “hopscotch” into the DEATH box. When we take that jump, what happens? Does it matter what you and I believe? In Hopscotch, Myra lays out, in child-like fashion, the logical argument that what you and I believe is critical for deciding what happens to us when we go from LIFE into DEATH. What happens to you and to me after we die? Just ask Myra!